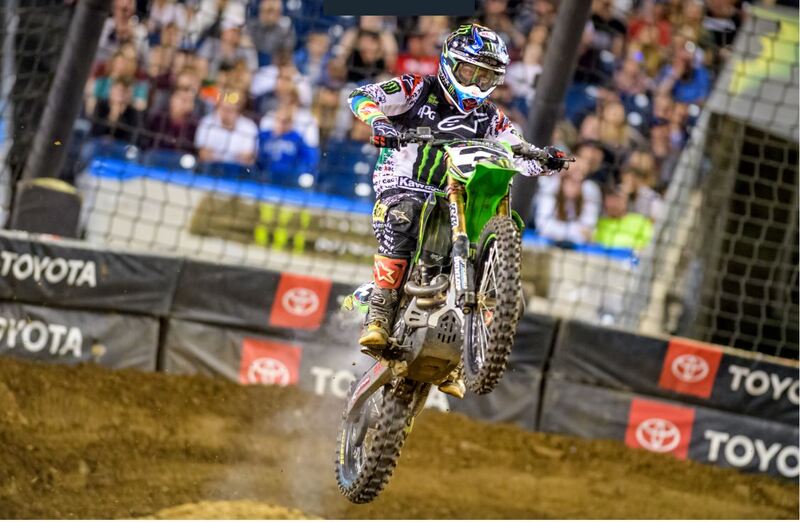 Monster Energy Kawasaki’s Eli Tomac returned to the top of the AMA Supercross podium at Nashville, but had to do it the hard way. Not only did he have to pass half the riders in the field including points leader Cooper Webb, but to even get into the main he had to overcome motor troubles that sent him to the Last Chance Qualifier. The main event started with all the fast guys up front and Tomac outside the top 10. Cooper Webb got the holeshot with Marvin Musquin hot on his heels. On the second lap, Musquin self-destructed in the whoops, hitting the ground hard. 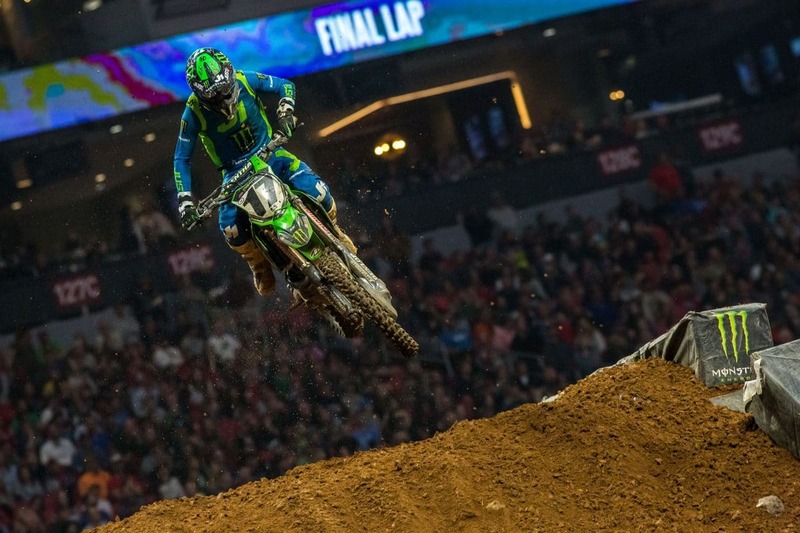 Joey Savatgy inherited second place, but then he fell and took Ken Roczen with him. That left Webb looking like he would cruise to an easy win, but it didn’t happen that way. Tomac took advantage of all the chaos to move into second place by lap eight. One lap later he moved past a very defensive Webb and started to pull away. Baggett then started pressuring Webb with Dean Wilson close behind. Eventually, Baggett would pass Webb, but by that time, Tomac was almost 10 seconds away. Musquin rode hard to catch up to sixth with Roczen catching up to eighth, but they both lost ground in the championship. When it was over, Cooper Webb’s third place was enough to extend his points lead to 21 points. 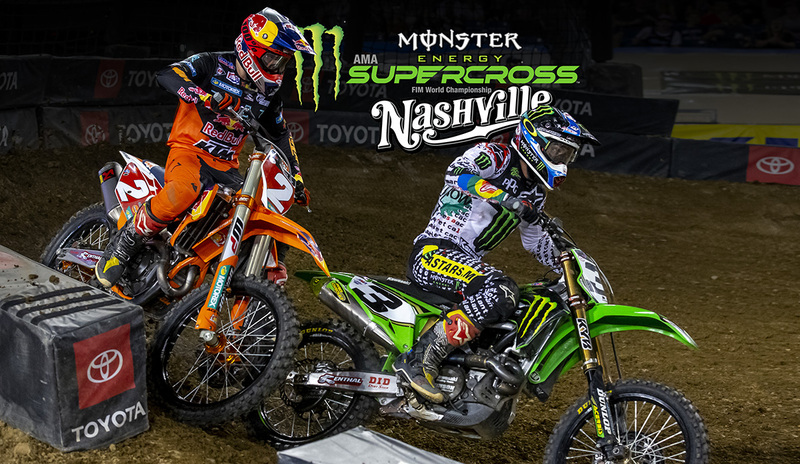 For extended coverage of the 2019 Nashville Supercross, click here. The first start of heat one saw Mike Alessi and Joey Savatgy go for the holeshot. Cooper Webb went down on the first lap and Marvin Musquin got into the lead, but everything was called back to the line when Ronnie Stewart and Tyler Enticknap went down and officials brought out the red flag. All the riders returned to the line for a complete restart. Everything changed this time around. Eli Tomac and Cooper Webb traded paint on the first lap while Musquin appeared to struggle with Justin Bogle a few places back. Soon, Tomac established himself in the lead while Joey Savatgy reeled in Webb. Everything changed in the late laps. Tomac pulled off with a mechanical problem at the same time as Savatgy passed Webb. Musquin went down, dropping all the way back to 11th. In the end, Webb made several huge mistakes and Savatgy was able to pull off the win. Musquin got up to 8th, eliminating the need to go to the LCQ, where he would have had to deal with an angry Tomac. 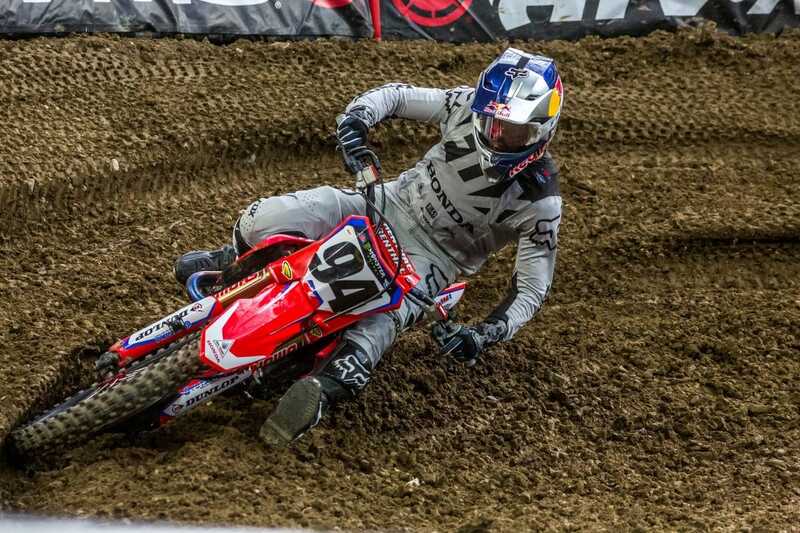 Honda had its best heat of the season with Ken Roczen and Cole Seely going one-two in heat two. It didn’t start that way. Zach Osborne got the holeshot with Blake Baggett close behind. Roczen passed them both, and Baggett had a number of troubles, dropping him back to fifth. Soon, the two Honda riders established themselves in front while Osborne held off Dean Wilson for third. The Last Chance Qualifier was easy work for Eli Tomac despite a mediocre start. He passed Austin Politelli within a few laps an cruised to what should have been an easy win. But in the last few laps, his Kawasaki started smoking. The team had performed a quick motor change between races, and there was a possibility that something wasn’t quite right. He won, but the bike was sequestered back to the pits quickly.